The first time I went to Trinity, I took my parents to celebrate a rather important anniversary. The food was marvellous and beautifully presented, and I was heartbroken to find I had taken my camera out of my bag only the night before. I needed to go back, to sample the great food and to give it the write up (with pictures) it deserved. Located in the heart of the old town, it is an oasis of calm away from the madness that is Clapham High street. Whereas the high street is heavily influenced by the indomitable Infernos and its crowds flowing from bar to bar, old town is much quieter with a few restaurants and local pubs and bars. Trinity is conspicuously tucked away and I only succeeded in locating it once I had been informed that there were fairy lights heralding its entrance. The restaurant itself is unassuming, a simple and clean space with white walls and understated pictures adorning the walls. The staff are friendly and talking to them felt like talking to old friends. They have so much energy and I genuinely felt that they just wanted me to be happy and enjoy my meal. I hadn't even looked at the menu yet but felt totally at home. As we were handed our menus, we were brought some warm homemade crispbreads with a smooth pink paste of salmon roe. Normally something I would turn my nose up owing to its intense fishy hit, I was pleasantly surprised by the layers of fishy flavour and although strong, went very well with the accompanying crispbreads. Digested with an aperitif of a rhubarb Bellini, we made our decisions and ordered. The last timed I dined here, I did the unthinkable and went for an all fish menu (barring the few nuggets of chorizo that came with my halibut). This time, veering away from the enticing a la carte options, I ordered off the more straight forward but incredibly good value prix fixe. 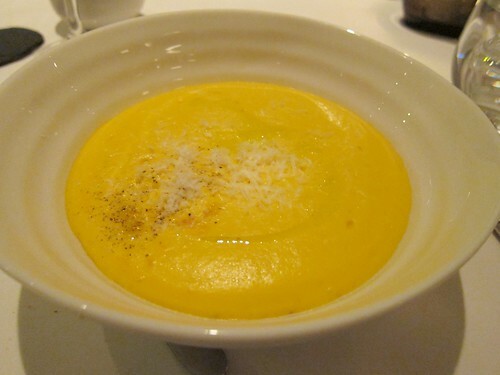 First up was a rather simple sounding butternut squash and parmesan soup. 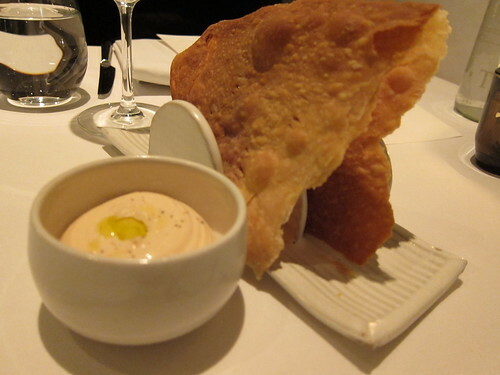 I wouldn't ordinarily opt for soup but having previously tried their sublime white onion and truffle oil soup that my mum had ordered and remaining green with envy for the rest of the meal, I wasn't going to make the same mistake twice. I am so happy to tell you that this was delicious. Slurp after slurp saw spoonfuls of sweet butternut squash with the occasional burst of flavour from the salty flecks of parmesan disappear down my gullet. I wouldn't say that this is a conventional soup as the consistency was far closer to that of a light and delicate mousse, but I was reassured that the secret came from the fact that it was one third milk and one third cream. My arteries screamed in despair as my taste buds nodded their approval. 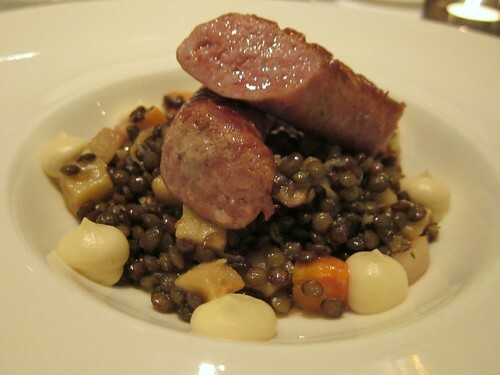 Next up was a solitary Toulouse sausage on a bed of puy lentils and dabs of cauliflower puree. A simple yet rather good main. I was slightly worried that a single sausage does not make a meal (breakfast maybe) but on reflection, the whole meal was actually finely balanced. The bed of puy lentils concealed a tiny treasure trove of lardons, although this tipped the salt balance of the dish a little too close to "generous". Jokingly, I asked our French waitress where the sausage had come from. Our rather animated waitress exclaimed "Toulouse of course!". If its provenance got her seal of approval, it certainly got mine too. Finally, pleasantly sated, I had the pleasure of digging into my dessert of pear tarte fine with a liquorice ice cream. Absolutely fascinated by the ice cream, I tucked in straight away and what I got was a subtle taste sensation. With no initial discernible liquorice flavour, tasting much more like a plain milk ice cream, the slight aniseed tang descended upon the extremities of my mouth and finished with fresh licorice. Strange, but lovely. By the time I had tried to analyse exactly what was going on, I had pretty much polished off the ice cream, and devoured the remaining tart "au natural". I had eaten well and wasn't ready to leave. 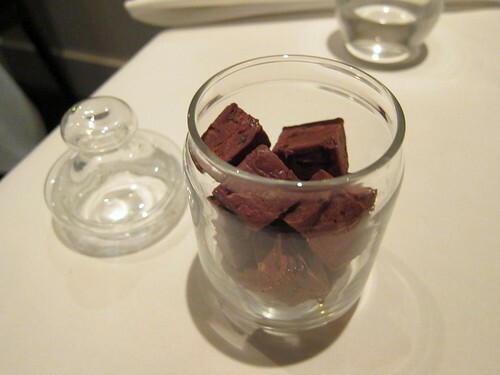 I ordered some coffee and alongside came a rather generous portion of some of the most delightful nuggets of fudge I had ever tasted. They summed up everything I loved in this place. Simple, unpretentious food, well executed, beautifully presented and made with care and attention. My companion's "celebrity" goggles were on and spotted Jean Baptiste, maitre'D of the F Word, dining happily in the center of the room. I am sure if he had dined here a few months earlier, it would have been a shoe-in for best local restaurant. My local and I love it. It all sounds wonderful! Not my local,but no doubt I'd be making a trip there soon. Sounds like a big thumbs up! I went to their Cov Gdn incarnation, Thyme, but haven't been along to Clapham yet. I must go. I was sold at "rhubarb bellini". That sounds like a fantastic meal. Very nice review, I enjoyed reading it. 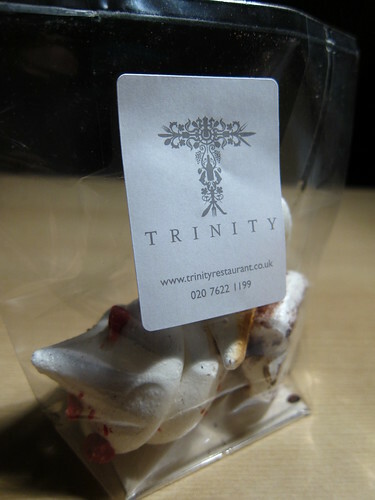 I went to Trinity last year and thought the same as you, very clean, rather straight-forward and quite delicious food. It's on the opposite end of town for me, so don't know if I'll make it back, but definitely enjoyed my dinner there. Sounds really good but the main looks a bit on the small side... Otherwise everything looks fantastic and definitely worth a visit! @noodlecapriciossa - You won't regret the trip and handily located on the Northern line. @aforkful - Didn't know about Thyme but will definitely check it out now. @ginandcrumpets - A good start to a great meal. @LaissezFaire - I would even say that it's worth a trip but much more enjoyable when it's a stumble home. @anon - It may have seemed small but the whole meal was well balanced. Stuffed by the end of it. We loved our meal at Trinity every bit as you did. What a great place. 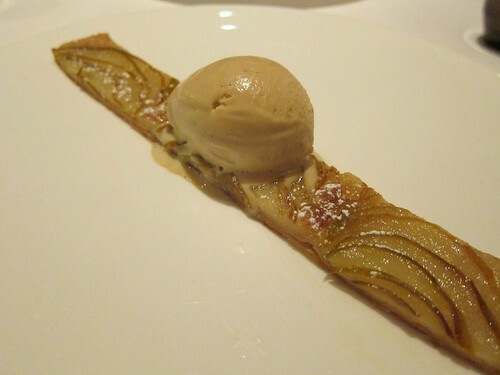 I love the idea of the licorice ice cream with the pear tart even if it did taste a bit strange. Tried the prix fixe here after reading your write up. The menu had changed when I went but the wild garlic soup was one of the best soups I've ever been served in a restaurant. We didn't get offered that pot of fudge though - boo.